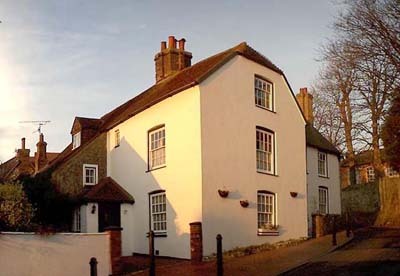 Kemps is situated at the Eastern end of the High Street and was built around 1540 by the Blaker Family. This family and their descendants have been significant and wealthy landowners within Portslade and elsewhere in Sussex. They have been associated with the nobility, and held positions as surgeons, Members of Parliament, and mayor of Brighton. Two wings built in three stages? The house consists of two wings, the Eastern wing being built first. The house has substantial structural oak beams throughout, and there is evidence to support the theory that the two wings may actually have been built in three stages. Old foundations discovered during the exacavations for the new road in 1975 revealed a passageway possibly to the Manor, and old foundations joining the existing house, which indicates that there probably was another house here before 1540, which could explain where the Blakers were living between 1485 and 1540. The house is flint with brick dressings and quoins. The walls are up to 2 feet thick in places. The site of the house is framed by high flint walls, and is situated just opposite from the site of the Old Manor. Kemps was the home to the Blaker family for many generations. The last Blaker living at Kemps appears to be Anna Kemp Blaker (died 1869). Cordelia (died 1854) was left the house by her father, and her will states that the house was to be sold and divided up between the rest of the siblings. It is not certain whether Anna Kemp Blaker bought the house or not, but according the census she was living there from 1854. The attic rooms are said to have been used as a Meeting House by the first Quakers during the the reign of Henry VIII. The web page states: ‘The attic rooms are said to have been used as a Meeting House by the first Quakers during the the reign of Henry VIII.’ This is unlikely, as Henry VIII died in 1547 and the Quaker movement did not begin until 1647. My grandfather owned Kemps until he died in (I think) the 1960s. At some point during his ownership the two wings became separate houses. There was a barn in the large back garden plus an extremely damp cellar with a glass rooflight. The spiral stairs to the kitchen I remember. There was also a tombstone laid as part of the path in the back garden. We knew that there was supposedly at least one underground passageway but never found it. Also a secret back-staircase I seem to remember. A great old house. The Blaker family that owned Kemps is not currently known to be related to the family of Sir John George Blaker (Mayor of Brighton 1895-8). If anyone can prove otherwise I would be very pleased to know (always looking to expand the family tree). I very much doubt from my research that the Portslade Blakers are related in any way to Sir John Blaker. Sir John’s family I believe originated from Lindfield, on to Lewes [South Malling] then to Brighton in 1799. I was informed that it was Roman Catholics, not Quakers, who held secret meetings in Kemps during Henry VIII ‘s reign. All Christians were Catholics during Henry VIII’s reign. Even though he had become Head of the Church of England because of his divorce from Rome and from Katherine of Aragon, Henry remained, in principle, a Catholic. When his daughter, Mary, a staunch protestant came to the throne, she had a 5-year burning spree of Catholics. Both her little brother, Edward VI, and sister, Elizabeth I, were pretty tolerant. Elizabeth, in particular, was pragmatic when it came to religion. The only time she was not, was towards the end of the 16th century, when fear of an attack from Catholic Spain put her on alert, and she began to execute Catholics who had the remotest connection to Spain, particularly the Seminary Priests who had been educated at Valladolid and elsewhere, and their friends. At the beginning of the 17th century, all sorts of religious sects developed, deviating from traditional Christian teaching. Life became so intolerable for them, that many sailed to America to practise their faith in peace. The Quakers, however, are famed for their secret Meeting Houses, so this seems the most likely source of the story. Editor’s note: You are absolutely right Helen – read more here. My apologies, Helen and Ed. In my haste to scribble all that in this little box, I failed to check through what I had written. You are quite correct. Catholic Mary burnt protestants. My dad owned this house in the 90’s and I didn’t like it. It was spooky at night (I was a child at the time) and I had numerous ghostly experiences there, like the bed vibrating while I was in it. Beautiful house but I wouldn’t want to stay there again.